- NEW WATCH DESIGN, NEW UI DESIGN, more fashion and convenient. The old watch screen is 36mm diameter,now is 40mm diameter.More big, more clear.NO NEED TO ADJUST TIME BY HANDS, Once you scan the app, and connect your watch with your phones, the time will set automatically. Also can set the awake alarms ( only set 1 alarm on watch , but set 3 alarms via the phone app ) . With luminous dial ( need press the button S1 ) , convenient to use the watch at night with cool style. 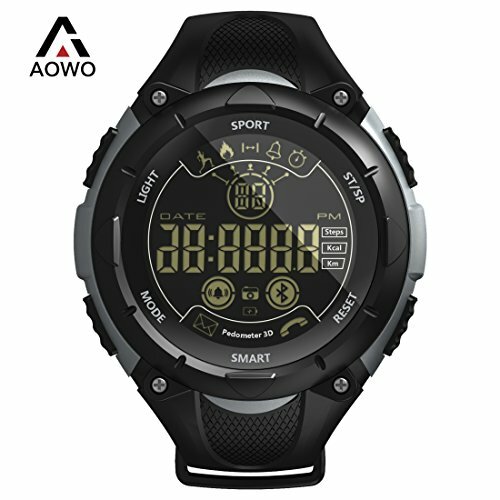 - 5ATM SWIMMING WATERPROOF : Adopts the super waterproof material , and it works great under water 50 meters with 5 ATM. Suitable for bathing , swimming and water rafting , enjoying no limitation and flexible wearing experience Attention that DONT press any buttons under water or put into hot water .